ST. CATHARINES, Ontario - A Brock University chemist and a Burlington, Ontario, chemical company have patented a green coating system that protects metals against corrosion. 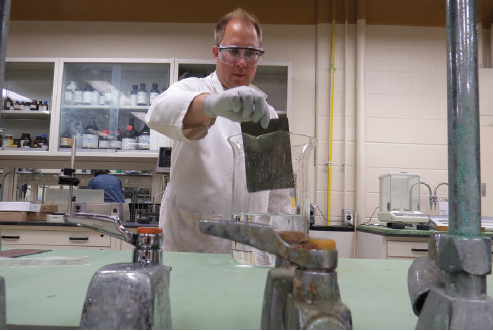 Organic chemistry instructor Paul Zelisko and Vanchem Perfor-mance Chemicals created tech-nology they named Greencoat, which uses silicon rather than heavy metals to bind coatings to both metal surfaces and paint. “It's a water-based system that, for all intents and purposes, has reactive sand in it,” says Zelisko. Sheets made out of steel or other met-als need to be pretreated with a substance that will guard them against damage caused by rust and salt. This substance must be able to stick not only to the metal but also to any paint that is applied to the sheets on top of the coating. The chal-lenge is that the metal is an inorganic substance, but the paint that is applied to the metal is an organic substance. Traditional coating systems use heavy metals - such as zinc phosphate, iron phosphate or chrome - to enable the inorganic and organic substances to stick to one another. Phosphates released into the environment cause various algal blooms in lakes and rivers, damaging aquatic plant and animal life. Also used in the process are solvents that have in the past polluted the environment. Unlike conventional methods, Zelisko and Vanchem's system involves a two-step process. First, a base layer is applied to the metal. Water mixed with silica is sprayed onto the metal, creating a chemical bond with the metal. This cleans the metal but also deposits silica onto the surface. This coating not only protects the metal but acts as a primer for the second layer, which is designed to bond well to paint. The second layer contains polysilicates, the basis of which is silicon. Silicates can be modified to stick to both metals and paints. When treated metal sheets were put into salt-spray chambers, where a fine mist of salt water is continually sprayed onto the metal until it starts to show signs of corro-sion, the new coating ranged from 1,800 to 3,000 hours, which is almost three times what is required by the industry, explained Zelisko. McLeod says that the initial price of the coating may be more expensive than a zinc phosphate one. But factoring in environmental disposal, maintenance and other costs associated with non-green coatings, companies could save money in the long run. The Ontario Centres of Excellence sup-ported the research partnership through its OCE Collaborative Research Program. The team received the patent for Gre-encoat silane-based pretreatment on Aug. 2 in the United States, with Cana-dian and European patents pending.